of wealth and guess what will he do if he is happy and pleased with you? He will shower you with all the wealth and money that you ever desire!!! But the big question is, how to keep Lord Kuber happy? The answer is pretty simple, just follow vastu honestly to attract more money. These vastu guidelines for money facilitate the flow of wealth and prevent blocking of your well-deserved riches. Never make swimming pool, water body or anything lower than the normal ground level in the South-West corner (applicable to home, office or any other building). Place the cash locker or cash almirah close to the South or South-West wall so that it opens in the North direction. North is the direction of Lord Kuber and opening of locker in North direction allows Kuber to fill it again and again. Avoid placing cash locker in any other direction. Never ever, under any circumstance, place the cash locker under any beam as this puts a lot of financial stress on family or business. One of the trick to attract wealth is to place a mirror in front of your cash locker so that the mirror shows an image of cash locker. This is emblematic that your wealth is doubled. Keeping the North-East portion clutter free and open at all times attracts wealth towards you. Avoid making staircase etc. in this portion. Never keep anything heavy suchlike machinery etc in the North-East corner. Make sure to avoid any high rise buildings, temple etc. in front of NE of your plot or home as this leads to loss of wealth. If there are high rise buildings and temples then at-least make sure that their shadow doesn’t falls on your home or plot. Never make curved wall in the North-East corner of the boundary wall. Make it at right angles. Always keep the South-West portion of roof higher than the North-East portion. In other words the building roof must slope from SW to NE. Make sure that South and West walls of home and boundary are higher and thicker than the walls in North and East side. Always buy plot(s) which have more or at-least the same elevation than the surrounding roads. Never buy a plot which is at a lower level than the road facing it. As per vastu for money planting big and huge trees in the South-West portion of a plot stabilizes finance. This also helps to avoid misfortunes and mishaps in family and business. Never have big and high trees in the North-East side of a plot as it obstructs financial flow. Always make sure to keep the center of home as free area. Never make any construction (except a temple) in this part of a house as this is the Brahmasthan. Make the SW or West portion of the plot as store room. Always keep all doors and windows clean. If they are dirty then money flow is obstructed. As per vastu tips for wealth repair or replace any leaking taps or faucets; leaking of water denotes wastage and loss of money. Place a water fountain in North-East part of home. Make sure that water in the fountain is always moving; movement of water denotes flow of positive energy and wealth. Keep a fish aquarium in your home (which we insist) in the North-East portion of hall or living room. Always keep the fish aquarium clean and aerated. Decorate the main or entrance door of your home distinctively to enable prosperity and wealth find your easily. Also decorate the name and number plate of your home. Keep this area brightly lit and beautifully colored. Make sure to feed water and grains to birds in your plot’s yard, this attracts positive energy and wealth. Wealth is mainly represented by purple color, hence keep a purple colored plant in your home. However, if you find it difficult to get a purple colored plant then keep a money plant in purple colored pot. Follow these vastu guidelines to gain wealth and enjoy financial freedom for the rest of your life. We have expertise to remove all Vastu Dosha, using POWER OF PYRAMID. Just Book An Appointment With Us To Manage Positive Energy of Your house using PYRAMID VASTU. WE HAVE GATHERED SOME OF THE MOST POWERFUL TOOLS TO ATTRACT FORTUNE, PROSPERITY, WEALTH, MONEY AND LUCK. HAVE A LOOK ON THESE ITEMS. This pre-programmed Pyramid Yantra not only helps to remove all fortune blocks and their ill-effects, but also generates the positive and beneficial effect of Pynergy. Fortune Plate is a multi-purpose tool; can be used as your nameplate on the door with your name printed on it or can be fixed anywhere with some mantra of positive message on it. Practical to use and also inbuilt with dual pyramid yantra and copper plates. Explore this new tool to optimize your fortune! 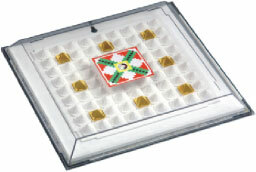 This yantra with flexible Pyra power plate inside is for prosperity, which attracts more money & business. With assed energy of 'Fortune Yantra' on top. Just place the Fortune Seat on the chair before you sit. Ideal on (Chairperson/Owner) main chair of the Shop, Office and home. Fortune Seat also contains sponge layer and velvet cover, which is comfortable to sit. Business disc attracts economic growth, better financial position and good business. It works on subtle level to enhance your fortune. It can be use for shops, offices and factories. It helps in better business decision & concentration. It is must for Chair person, Head of Department, Management persons, Senior Officers etc. It is very simple to use and gives fantastic results.